40 Million Credit Cards — VIII. For the original bitcoin paper see (PDF) (HTML). Narrator: Back in the meeting. From a closed door marked "Private" a voice is heard. Voice from door: So should we accept dollars? The next panel shows a close-up of a man apparently seated at a table. Man: Despite 3–4% just vanishing? The next panel shows a group of people, including the man just seen, seated at a circular table. A woman stands in the background and gestures with her arms. Woman: Sadly, it's much worse than just 3–4% vanishing. Woman: The dollar is rapidly declining. The public has lost confidence in it. The next panel shows the same woman standing next to a large chart that shows a curve labeled "dollars per bitcoin" that gently slopes downward. The horizontal axis is labeled "time". Off-panel voice: Doesn't look that bad. Off-panel voice: I've seen worse. Off-panel voice: It's quite gradual. The next panel shows the woman in a close-up view. 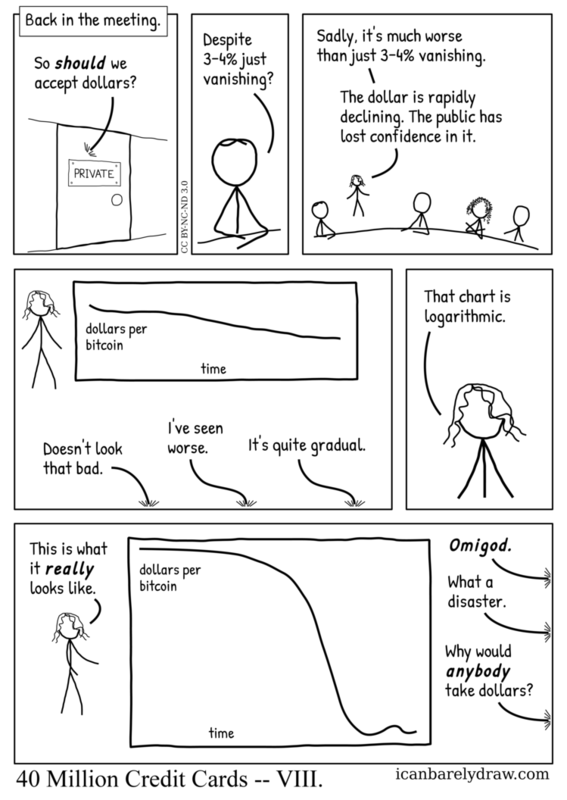 Woman: That chart is logarithmic. The woman is seen standing near another chart. It is labeled the same way. It begins horizontally but then descends steeply and stabilizes near the bottom with minor undulations. Woman: This is what it really looks like. Off-panel voice: What a disaster. Off-panel voice: Why would anybody take dollars? Title: 40 Million Credit Cards -- VIII.